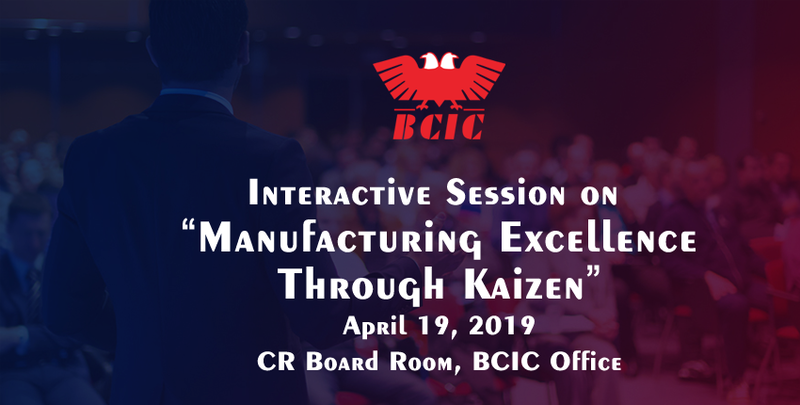 Interactive Session on "Manufacturing Excellence through Kaizen"
We are pleased to extend our invitation for an Interactive Session on “Manufacturing Excellence Through Kaizen” hosted under the aegis of the Manufacturing Expert Committee on Friday, April 19, 2019 between 3.30 pm and 4.30 pm at the CR Board Room, BCIC Office, Bangalore. Mr. A N Chandramouli, Past President, BCIC will anchor the session. Manufacturing Excellence is not just the best way to do it today, but continually improve to the next level. Principles of Manufacturing Excellence is applied to achieve higher productivity, reduce Lead Time, achieve consistency in quality, improve operations, eliminate waste, create Lean processes and change the way people think and align their mind set towards achieving company’s set goals. We request the members to kindly make it convenient to participate at the interactive session. Kindly also depute Senior personnel from your organization to participate at this knowledge sharing capsule. Mr. Chandramouli is an expert on Profit Center Management, General Management, Business Development, Manufacturing management, B-B marketing, Industrial Products marketing, Strategic Alliances, Setting up Greenfield projects, Supply chain development. Specialties: Industrial Marketing, Manufacturing, Quality, Team building, Kaizen, Cost management. In his over 3 decades of Industrial career, Mr. Chandramouli has held many Leadership positions in diverse industries such as Machine Tools (Starrag, Makino), Electrical Industry( Lapp, Cooper), Consumer Durables (Amtrex Hitachi appliances), Consumer products (Unilever- Ponds division), Trucks (Tata Motors). He is highly passionate for Strategic alliances, Industrial product marketing, Innovation, Quality Management Best practices, World Class Manufacturing & Skilling initiatives with a clear focus on Customer orientation in the organizations he worked for. Chandramouli is a Graduate in Mechanical Engineering from NIT Trichy (RECT), and Post Graduate in Management from IIM- Calcutta. A line of confirmation for participation to the listed email ID: bcicevents@bcic.org.in will be appreciated.